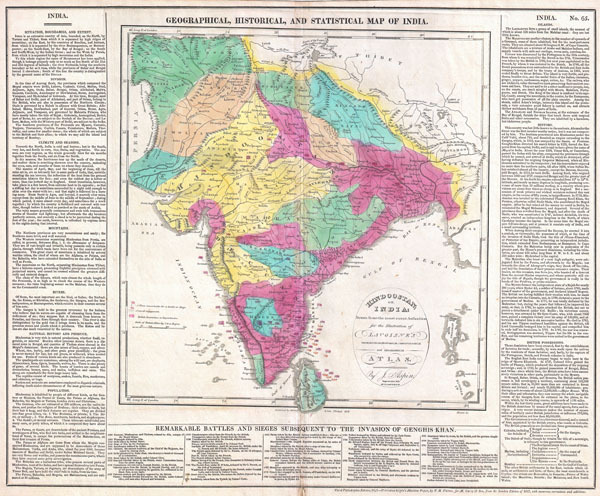 This is an attractive 1821 map of India issued by Matthew Carey. Covers the subcontinent from Tibet Kashmir south to Sri Lanka or Ceylon. Color coded according to territory with British possessions or dependencies in red. Shows the locations and dates of no less than twenty-five battles from 1300 to 1804. Surrounded by text discussing the geography, climate, history and peoples of India. Drawn by J. Aspin. Published by Matthew Carey & Son as plate no. 65 in the 1821 third Philadelphia edition of Lavoisne's Genealogical, Historical, Chronological and Geographical Atlas. Mathew Carey (1760 - 1839) was a Dublin born publisher who established himself in Philadelphia in the late 18th and early 19th century. A young man of socially progressive views, Carey's first known publication, produced when he was but 17 years old, was a pamphlet criticizing dueling. Another pamphlet, issued in the same year, attacked the Irish penal code. Shortly afterwards, in 1779, legal issues, possibly arising from his liberal political activism, forced Carey to flee to Paris. In Paris Carey had the good fortune to befriend the visiting American diplomat and founding father, Benjamin Franklin. As an Irishman chafing under the rule of England, Carey sympathized with and admired the American revolutionary. The liberally minded pair struck up a lifelong friendship and Carey was hired to work at Franklin's press in Passy, France. A year later, Carey returned to Ireland and resumed his politically provocative publishing career with "The Freemans's Journal" and "The Volunteer's Journal". It didn't take like for political pressure to once again force Carey from Ireland - this time to America (1784). Though largely without funds, Carey convinced the Marquis de Lafayette, who he knew from Franklin's Paris circle, to lend him funds to establish a new publishing concern in Philadelphia. Despite this loan, Carey's firm remained underfinanced and opened on a shoestring budget. It was most likely his limited budget that led Carey to some of his most important publishing innovations. At the time cartographic publishing was dominated by large printing houses in London and Paris where most, if not all, of the work was completed in house. Without the finances to emulate this large publishing houses, Carey was forced to outsource much of his publishing work. This set the stage for subsequent American publishers who, in order to compete effectively with European firms, relied on an often bewildering network of alliances and collaborations. Carey was a also a master of republishing many of his own maps in multiple different atlases and formats to maximize their profitability. His most important work is without a doubt the 1795 issue of the American Atlas the first atlas to be published in America. Carey died in 1839 but was succeeded by his son Henry Charles Carey who, in partnership with his brother-in-law Isaac Lea, published numerous important maps and atlases under the Carey and Lea, Lea Brothers, and Lea and Blanchard imprints. Lavoisine, C. V., Lavoisne's Genealogical, Historical, Chronological And Geographical Atlas. (1821 Philadelphia Edition).